This book brims with insights. I love to learn new things about familiar and dear subjects, and again and again I found myself writing in the margin an exclamation mark or a reminder to return to that page. Amazon has dozens of five-star reviews, many of which communicate the value of the book better than I have. The author, Lois Tverberg, also has a website with excerpts, articles, and a blog. We have one drawing from which we will select two winners at random. You may enter the drawing one time only. Email addresses will be used only to notify the winners. The contest ends on Friday. A small stone seal found recently in the excavations of Tel Beit Shemesh could be the first archaeological evidence of the story of the biblical Samson. The seal, measuring 1.5 centimeters, depicts a large animal next to a human figure. The seal was found in a level of excavation that dates to the 11th century B.C.E. That was prior to the establishment of the Judean kingdom and is considered to be the period of the biblical judges - including Samson. Scholars say the scene shown on the artifact recalls the story in Judges of Samson fighting a lion. But excavation directors Prof. Shlomo Bunimovitz and Dr. Zvi Lederman of Tel Aviv University say they do not suggest that the human figure on the seal is the biblical Samson. Rather, the geographical proximity to the area where Samson lived, and the time period of the seal, show that a story was being told at the time of a hero who fought a lion, and that the story eventually found its way into the biblical text and onto the seal. The story continues and explains some of the geographical connections. This discovery reminds me that while Samson’s life largely centers in the Sorek Valley, the most prominent city of that valley is never mentioned in the narrative (Judges 13-16). If the interpretation of this seal is correct, the people of Beth Shemesh remembered their local hero with some pride. A high-resolution photo of the seal by Raz Lederman is available here. Scholars on the Record is a collection of interviews that Hershel Shanks has conducted with archaeologists and biblical scholars over the last 30 years. I found it a fascinating read, though not one person interviewed shares my perspective that the Bible is a trustworthy source. I’ve selected a few quotations that provide insight on biblical studies, archaeology, and the way scholars think. William Dever: “Originally I wrote to frustrate the biblical minimalists; then I became one of them, more or less” (19). Bart Ehrman: “That’s what the Exodus event is, that’s what the crucifixion is: It’s a God who intervenes, and when I look around this world, I don’t see a God who intervenes” (24). Hershel Shanks: “If I ever write a book on ‘How True Is the Bible?’ I’ll have to start out by saying that archaeology is not the way to find out; that it has very little to say” (57). Israel Finkelstein: “Archaeology is relevant when somebody tells me that the patriarchal material in Genesis reflects the realities of the second millennium B.C. Then archaeology is in full steam to prove that he is wrong” (66). Cyrus Gordon, explaining how they controlled for stratigraphy: “The Egyptian taskmasters were very good at implementing our instructions. They cracked whips. They used to beat the workers. I couldn’t imagine an American beating the workers, but the Egyptians did” (169). Yigael Yadin: “I don’t think God has anything to do with archaeology” (194). The book includes interviews with Elie Wiesel, Geza Vermes, David Noel Freedman, the Dothans, and others. I recommend it. "It is a figure with a beard and long hair, and it seems to be holding a weapon...The rest of the sculpture has not been found, indicating that it may well have been damaged. However, the upper part is in very good condition...The sculpture has been sent to the Hatay Archeology Museum, where it will be restored by a professional team...Harrison also showed that there is writing that says 'Suppiluliuma' at the back of the sculpture." In related news, an Assyrian vassal treaty tablet was discovered at Tell Tayinat in 2009 (see here). Two articles including the publication of the treaty tablet and a discussion of the archaeological context appear in the latest issue of Journal of Cuneiform Studies (pdf downloads available here). Harrison, T.P. and Osborne J. F.
2012 "Building XVI and the Neo-Assyrian Sacred Precinct at Tell Tayinat." Journal of Cuneiform Studies 64: 125-143. 2012 "Esarhaddon's Succession Treaty at Tell Tayinat: Text and Commentary." Journal of Cuneiform Studies 64: 87-123. Kitchen, Kenneth A. and Paul J. N. Lawrence. 2012 Treaty, Law and Covenant in the Ancient Near East. 3 parts. Wiesbaden: Harrassowitz. The head and torso of the human figure, intact to just above its waist, stands approximately 1.5 metres in height, suggesting a total body length of 3.5 to four metres. The figure's face is bearded, with beautifully preserved inlaid eyes made of white and black stone, and its hair has been coiffed in an elaborate series of curls aligned in linear rows. Both arms are extended forward from the elbow, each with two arm bracelets decorated with lion heads. The figure's right hand holds a spear, and in its left is a shaft of wheat. A crescent-shaped pectoral adorns its chest. A lengthy Hieroglyphic Luwian inscription, carved in raised relief across its back, records the campaigns and accomplishments of Suppiluliuma, likely the same Patinean king who faced a Neo-Assyrian onslaught of Shalmaneser III as part of a Syrian-Hittite coalition in 858 BC. Archaeologists at Hazor have discovered 14 large storejars full of grain burned in a massive conflagration during the period of the judges (c. 1300 BC). Volunteer Rob Heaton shares his experiences in the last days of the dig and more. The 2012 Lautenschläger Azekah Archaeological Expeditions Blog is being updated daily. Yesterday they confirmed the discovery of ancient fortifications. Matti Friedman describes a day of digging at the Philistine city of Gath. The Israel Antiquities Authority’s Archaeological-Educational Center invites the public to “Archaeologists for a Day” program at Adullam Park in the Shephelah on Monday, July 30. The cost is 20 NIS and pre-registration is required at adulam@israntique.org.il, Tel: 02-9921136, Fax: 02-9925056. The invitation (Word doc in Hebrew) provides more details. Seth Rodriquez has identified the most interesting photos for a Bible teacher from NASA’s Visible Earth website. High-tech aerial photos remove the ground cover so you can see what lies below. In a new article at The Bible and Interpretation, Yosef Garfinkel reviews some attacks on his work at Khirbet Qeiyafa and provides “an unsensational archaeological and historical interpretation” in which he provides 14 “facts,” concluding that “the site marks the beginning of a new era: the establishment of the biblical Kingdom of Judah.” That last word is problematic. At Christianity Today, Gordon Govier interviews evangelical scholars about the potential impact of the discoveries at Khirbet Qeiyafa. A 19th-century map of Jerusalem has been discovered in an archive in Berlin. The story about Islamic clerics wanting to destroy the Egyptian pyramids is not true. 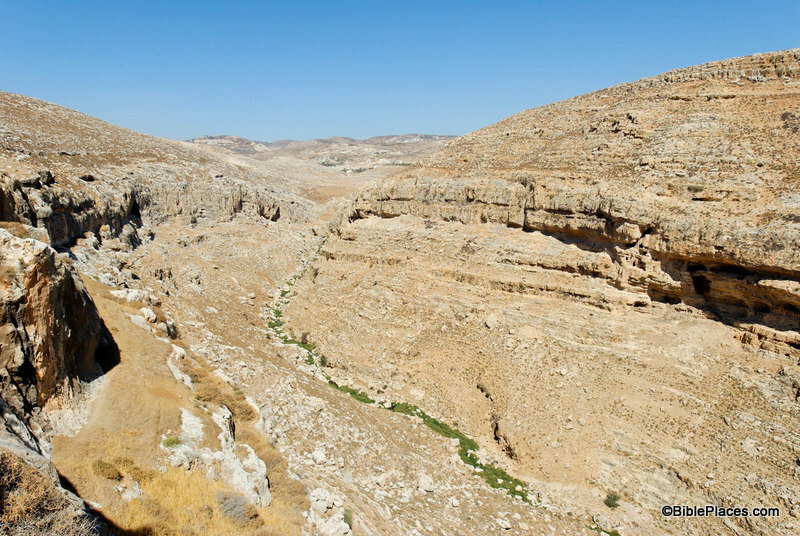 One of the most impressive additions to Volume 3 of the revised and expanded Pictorial Library of Bible Lands are the photos of the newly discovered Pool of Siloam. The original Pictorial Library was published in 2003 and the 1st century Pool of Siloam was discovered one year later. So naturally the original collection did not include any pictures of this significant site, but the revised version includes over 30. So this week’s photo comes from Volume 3 of the revised and expanded edition and is entitled “Pool of Siloam Excavations” (photo ID #: tb070305450). First, a note of explanation: If you have ever been to Israel and have walked through Hezekiah’s Tunnel, you were probably told that the small pool at the end of the tunnel was the Pool of Siloam. That is true but it should be clarified that that is the Pool of Siloam from the Byzantine period (AD 324-640). 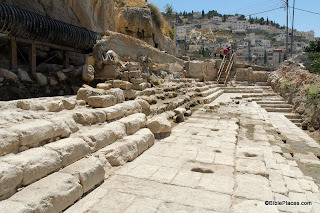 The pool pictured above is the Pool of Siloam that existed in the 1st century AD. This is a much larger pool than the Byzantine pool. The side that has been excavated is 160 feet long (50 meters). There are three groups of steps leading down, with each group containing five steps. The fifth step of each group is much longer than the others and probably served as a platform for bathers to stand on. This Pool of Siloam is the one that existed during the time of Jesus and His disciples. In fact, John 9 tells us that a miraculous healing occurred at this very spot. As they are leaving the Temple, Jesus and the disciples see a man who has been blind since his birth and the disciples ask Jesus a question that probably was debated by the leading religious minds of their day: “Who sinned, this man or his parents, that he was born blind?” (John 9:2, ESV.) The question gives Jesus the opportunity to teach them an important lesson that corrected their thinking and now serves as a comfort for all who have ever wrestled with incurable physical ailments: “It was not that this man sinned, or his parents, but that the works of God might be displayed in him.” (John 9:3, ESV.) Then Jesus made some mud by spitting on the ground, placed it on the man’s eyes, and told him to wash in the very pool pictured above: “Go, wash in the pool of Siloam” (John 9:7, ESV). The man followed Jesus’ command and could see after he washed the mud off his eyes. Unfortunately only part of the pool has been excavated. The rest of it sits under an orchard that the owners are not willing to remove (the last I've heard). Hopefully that situation will change in the near future so that more of this important pool can be exposed. 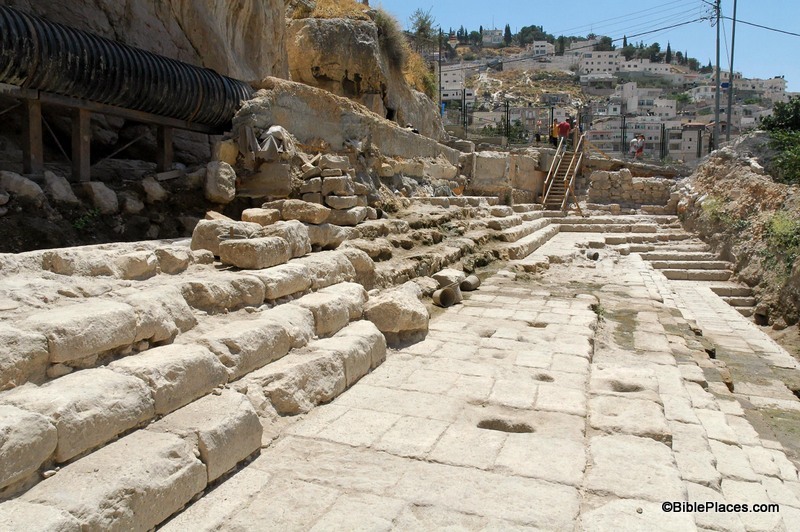 Additional photos and more information about the newly discovered Pool of Siloam are available here and here on the BiblePlaces website. Previous posts on this blog about the pool (which are numerous) can be found here. This photo, along with over 30 other pictures of the pool, is included in Volume 3 of the Pictorial Library of Bible Lands and can be purchased here. This blog noted before that the final excavation reports for Ashkelon were being made available as free pdf downloads. Volume 3, published last year by Eisenbrauns and covering Ashkelon in the 7th century B.C., is now available for download. And from Gath (Tell es-Safi), Aren Maeir gives a period-by-period summary of the 2012 season which concludes this week. Of particular interest is what appears to be a section of the Late Bronze city wall (photo here). “The first few hours on the mound were chilly and windy, but by the time of the coffee break at 9:45, the sun had warmed the tell to a comfortable degree. The fifteen minute respite sustained us until noon when work stopped for 45 minutes. After lunch we excavated for three more hours till 4 o'clock when the laborers began to return to Ramtha and we fortified ourselves with tea and bread. Invariably most of the field supervisors then returned to their plots to draw the top plans or help one another with section drawings. Darkness would force us to leave the mound and return to our camp by six o'clock. It was then almost time for supper. After a half hour elapsed in the mess tent we were ready to begin the pottery reading. We had worked out a system so each knew when he was due at the pottery tent, and in that way there was no delay. The remainder of the evening was given to preparation of the field books. Pressure lamps are not conducive to the kind of precision that is required for keeping records so one has to be careful to double-check each entry. The field book up to date, it was then almost eleven o'clock and time to retire for the night. From that moment on no human sound broke the stillness of the night in the plains of Gilead. Every minute of sleep counted in order to be ready to face the rigors of the next day's work. “Our camp consisted of about a dozen tents, mostly of the small variety, and was located to the east at the base of the mound, which is largely a rocky outcrop. With the exception of several chilly nights at the beginning of the season and a strong wind which cost us a half-day's work, the weather was nearly perfect. The countryside was green when we began and golden when we finished—just in time, for we were beginning to lose our workers to the grain harvest. Despite our pre-Easter apprehensions over the severe winter rains, it proved to be an ideal time for the campaign. In the end we felt we had a complete enough story of the tell to abandon the site to some future excavator, and we were determined to set down the story as soon as possible. However, the unforeseen event of June has delayed this report. Travel from east Jerusalem to Tell er-Rumeith on the heights of Gilead was not difficult in April and May 1967 as there was no international border to cross. As he observes, everything was to change the next month. Paul Lapp died tragically in a swimming accident in Cyprus a few years later. His wife, Nancy Lapp, edited these essays and prepared it for publication while raising their five young children. The Tale of the Tell is still available both new and used from the publisher and Amazon and may be available in your local library as well. Congratulations to the winners of last week’s giveaway of the Pictorial Library of Bible Lands. Elizabeth A. selected the five volumes of the Israel Collection, and Pamela M. chose Samaria and the Center, Jerusalem, Judah and the Dead Sea, Western Turkey, and Cultural Images of the Holy Land. Thanks to everyone for participating! “The winter of 1967 was an unusually cold and wet season in Jerusalem, and it reached its climax in the form of a blizzard on Easter Sunday, March 26. The Rumeith dig was scheduled to get underway on the first day of April, but there was some doubt whether the inclement weather would allow us to comply with our plans. We were fortunate to have some ideal weather right after Easter, so on March 30 the first contingent headed for Rumeith, and on the following day the rest of the staff followed with equal enthusiasm. The 1967 campaign took place between April 1 and May 12, a period of six weeks on a five-day week basis. Out of deference to our Moslem workers we observed the weekly holiday on Friday; out of consideration for the staff Saturday was also included. At the end of the work-day each Thursday the staff wasted no time as they hurried to Jerusalem to re-enter civilization at the American School in the form of a bath and a change of clothes. After being sandblasted for several days each week on the wind-swept mound, the latter were very much in order. “The Rumeith expedition was jointly sponsored by Pittsburgh Theological Seminary and the American Schools of Oriental Research. The budget was provided by the former, and the equipment and transportation by the latter. The staff was composed of the following: Howard M. Jamieson, who represented the Pittsburgh Seminary as codirector and also functioned as treasurer and field supervisor; Susan E. Culp of the University of Pennsylvania, anthropologist and field supervisor; Gavriel Flores, C.SS.R., a Brazilian and student at the Ecole Biblique, field supervisor; also Gustav Jeeninga from Anderson College, Indiana, Edward D. Grohman from Knoxville College, Tennessee, Philip J. King from St. John Seminary, Boston, Robert A. Hutchison from St. Charles, Illinois, and Walter E. Rast from Valparaiso University, Indiana, field supervisors; Thomas Schaub, O.P., from the Ecole Biblique and Aquinas Institute in Dubuque, architect; Fouad Zoghbi of Bethlehem, draftsman; Issa Zoghbi, Bethlehem, assistant draftsman; Aletta Jeeninga of Anderson, registrar; Sister Marie McNamara of Rosary College, River Forest, Illinois, pottery mending; Ahmed Odeh, representative of the Jordan Department of Antiquities. The service staff included Aboud Dhib Nasif as driver and camp manager; Kamel Ikhdayir as cook with two assistants; and Nasir Dhiab as chief technical man with eight assistants from Taanach, Samaria, Balatah, and Bab edh-Dhra'. The staff was very dedicated and worked together in a spirit of warm friendship and good humor. The continuation of the account will be posted tomorrow. Bryant Wood has posted a summary of this season’s excavations at Khirbet el-Maqatir. Joe Yudin recommends a short, wet hike near the Sea of Galilee. He has also created the best illustrated page on the first-century boat in Galilee. Ferrell Jenkins has discovered a way to keep tabs on the water level in the Sea of Galilee. Israel’s Attorney-General says that all construction on the Temple Mount must adhere to existing laws. An individual has filed a complaint with Israeli police against the playing of soccer on the Temple Mount. Matthew Kalman’s story on the trial of the James Ossuary and Jehoash Tablet from The Jerusalem Report is now available for purchase in Kindle format (with free borrowing for Prime members). The ASOR weekly roundup is here. This week’s photo comes from Volume 2 of the revised and expanded edition of the Pictorial Library of Bible Lands. It is entitled “Cliffs Near Michmash and Geba from Southeast” (photo ID #: tb092706140). However, the name of the picture does not do justice to the thrilling events that took place here in the time of King Saul. First Samuel 13 tells us that shortly after Saul was crowned king, the Philistines had penetrated deep into Israelite territory. Normally the Philistines controlled only the coastal plains, but at this point in history they were attempting to gain control over the hill country as well. They were encamped at Michmash in the territory of Benjamin, in the heart of Israelite territory (1 Sam 13:5). Saul mustered his troops but suffered a defeat (1 Sam 13:6-7). He was in dire straits and his character was put to the test as he waited for Samuel to arrive and offer sacrifice on behalf of the troops (1 Sam 13:8). Saul cracked under the strain and offered the sacrifice himself, incurring God’s judgment (1 Sam 13:9-15). This chain of events only made matters worse and the Philistine army started spreading out from Michmash, gaining control over the heart of Saul's kingdom (1 Sam 13:16-18). The camps were only about a mile apart. There is a pass between the two sites at the head of the valley (near the top center of the photo) where the main road was and still is today. That strategic pass through the area was probably the reason the Philistine soldiers chose to camp at Michmash: if they camped close by, they could monitor and control the traffic through the pass. In the end, God rewarded Jonathan’s faith by giving him the victory. He and his equipment bearer killed 20 soldiers and the rest were thrown into a panic (1 Sam 14:14-15), which provided the Israelites with an opportunity to win a great victory. (You can read the rest of the story here.) Many things have changed in the land of Saul and Jonathan over the last 3,000 years, but these cliffs still stand today as a silent witness of the faith and heroic deeds of Jonathan. This photo is included in Volume 2, "Samaria and the Center" of the Pictorial Library of Bible Lands can be purchased here. For more on Michmash, Geba and the pass, go here. A Reuters report describes how the Jordan River has shrunk over the years but a new plan will bring the stream back to life. Today, as a result of years of overtaxing for irrigation and drinking water, [the Jordan River] snakes irresolutely along the valley from the Sea of Galilee to the Dead Sea. As far as the eye can see, it is just a few meters wide. "It's five percent of what once flowed," said Ben Ari, who is one of the rehabilitation project leaders. "You can easily walk across without getting your head wet." Almost all the water that feeds the river is diverted by Syria, Jordan and Israel before it reaches the south, he explained. But for the first time, Israel -- which is two-thirds arid and has battled drought since its establishment 64 years ago -- has a water surplus. This follows decades of massive investment in the country's water infrastructure. It re-uses 75 percent of its wastewater, mostly for agriculture, and by next year, 85 percent of drinking water will come from desalination plants. The Israeli government has chosen to use this bounty to rehabilitate the country's rivers. The Jordan tops the list. The rest of the story describes other ways that Israel plans to promote tourism in the area. The article does not mention the impact this may have on the Dead Sea. According to Kobi Sharvit, director of the Israel Antiquities Authority Marine Archaeology Unit , “Among the finds we’ve discovered now are large mooring stones that were incorporated in the quay and were used to secure sailing vessels that anchored in the harbor c. 2,300 years ago. This unique and important find finally provides an unequivocal answer to the question of whether we are dealing with port installations or the floor of a building. In addition, we exposed collapse comprised of large dressed stones that apparently belonged to large buildings or installations, which was spread of a distance of dozens of meters. What emerges from these finds is a clear picture of systematic and deliberate destruction of the port facilities that occurred in antiquity”. 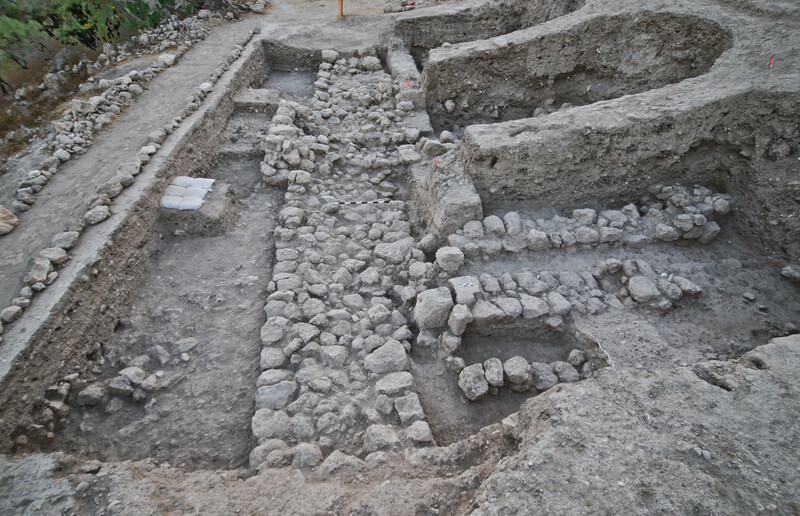 Sharvit adds, “Recently a find was uncovered that suggests we are excavating part of the military port of Akko. We are talking about an impressive section of stone pavement c. 8 meters long by c. 5 meters wide that was partially exposed. The floor is delimited on both sides by two impressive stone walls that are also built in the Phoenician manner. It seems that the floor between the walls slopes slightly toward the south, and there was a small amount of stone collapse in its center. Presumably this is a slipway, an installation that was used for lifting boats onto the shore, probably warships in this case”. According to Sharvit, “Only further archaeological excavations will corroborate or invalidate this theory”. The bottom of the ancient harbor was exposed at the foot of the installations. There the mooring stones were found as well as thousands of fragments of pottery vessels, among which are dozens of intact vessels and metallic objects. The preliminary identification of the pottery vessels indicates that many of them come from islands in the Aegean Sea, including Knidos, Rhodes, Kos and others, as well as other port cities located along the Mediterranean coast. The story includes photographs of the ancient quay, a mooring stone, and an imported bowl. High-resolution images are available from the IAA here. The city of Acco was known as Ptolemais in the Hellenistic and New Testament periods. It is mentioned once in the New Testament in connection with Paul’s return from his third missionary journey (Acts 21:7). You can read more about the city here. Last month we gave away the Israel Collection of the Pictorial Library of Bible Lands to two winners. This week we are going to let the winners select the five volumes of their choice. Perhaps if you win, you will choose the Israel Collection, volumes 1-5. If you are more interested in the travels and writings of the apostle Paul, you might opt for Eastern and Central Turkey (vol. 9), Greece (vol. 11), The Greek Islands (vol. 12), and Cyprus and Crete (vol. 13), and Italy and Malta (vol. 14). If your interest inclines more to the Old Testament and you’ve already purchased the Israel Collection, we’d recommend Jordan (vol. 6), Egypt (vol. 7), Lebanon (vol. 8), Eastern and Central Turkey (vol. 9), and Cultural Images of the Holy Land (vol. 17). We have one drawing from which we will select two winners at random. You may enter the drawing one time only. The contest ends on Friday. In 1996, Israel Finkelstein proposed a significant lowering of dates in the Iron I-II periods in Israel. This sparked a debate which has often been heated in part because Finkelstein’s conclusions entail a virtual elimination of the United Monarchy as described in the Bible. This is the result of Finkelstein’s dating of the end of the Iron I period, with its poor material culture and lack of monumental construction, to the time after David and Solomon lived. End of Qasile X: 1039-979 B.C.E. Just to get a better handle on the matter, I pulled out my calculator to determine the middle of the range for each site: Qasile: 1009; Megiddo: 976; Yoqneam (Jokneam): 1021; Tel Hadar: 1011. So it’s safe to say, based upon these results, that the Iron I ended and Iron II began about 1000 BC. With the calculator still handy, I tabulated the average of the four dates. It came out to 1004 BC. That’s a familiar number to students of biblical history who know that (1) Shishak invaded Israel in 926 BC, the fifth year of the rule of Rehoboam, such that (2) Solomon died in 931 BC, after forty years on the throne following (3) David who died in 971 and ruled for 33.5 years in Jerusalem, or 1004 BC. This 1004 BC date was acknowledged by the Municipality of Jerusalem which celebrated the 3000th anniversary of the city in 1996 (mistakenly, because of the missing year “0”). The Carbon 14 numbers provide nothing more than ranges, with varying amounts of probability, but I thought it curious that the average date of the numbers for the beginning of Iron II just happened to be the year that David began ruling in Jerusalem. The above quotation is from page 114 of Amihai Mazar, “From 1200 to 850 B.C.E. : Remarks on Some Selected Archaeological Issues,” pp. 86-120 in Israel in Transition: From Late Bronze II to Iron IIa (c. 1250–850 B.C.E.). Volume 1. The Archaeology, ed. L. L. Grabbe. A recent article that reveals the lack of precision in Carbon 14 dating is “The Four Pillars of the Low Chronology,” by Daniel A. Frese and Thomas E. Levy, pp. 187-212 in Historical Biblical Archaeology and the Future. More photos and a video of the gold treasure from Apollonia have been released. The value of the coins is now given (in at least one article) as $500,000. The “Egyptian Antiquities’ Renaissance Project” has been launched in order to turn archaeology into a major source of income in Egypt. The Museum of the Bible, featuring the collection of the Steve Green family, will open not in Dallas and not in New York, but in Washington, DC. I wonder if you could name 6 Christian Sites in Rome You Should Know About. Shmuel Browns describes and illustrates the newly opened archaeological site on Mount Gerizim. Joe Yudin visits “Genesis Land” in the Judean wilderness. The owner of a bed-and-breakfast in Sepphoris was convicted of damaged antiquities when carrying out renovations on his property. 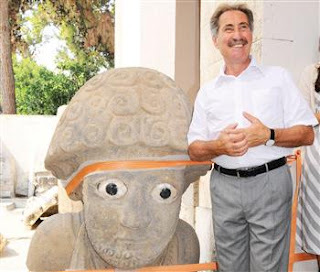 Itzhak Beit-Arieh, Associate Professor of Archaeology at Tel Aviv University, has passed away. An early Iron Age inscription has been discovered. This may be the final season of excavating Khirbet Qeiyafa. The excavators have identified the next site they wish to excavate. Chandler has also has posted a series of photos from the first week of the dig. Don’t miss his great photo of a sling stone! With the recent release of the revised and expanded version of the Pictorial Library of Bible Lands, I thought it would be helpful to start a series of posts that highlight some pictures from the collection. With over 17,000 pictures in 18 volumes, there is an immense amount of material in there. My purpose will be to feature one photo per week that can be especially useful in the classroom or in the church. Although the PLBL collection contains many of the typical “postcard” shots of the usual tourist locations, its true value lies in the more unusual pictures that illustrate a particular feature of geography or archaeology that can be easily overlooked or that other photo collections fail to include. It is these types of pictures that I would like to highlight and discuss. Preference will be given to photos that were not included in the original edition of the Pictorial Library and that are not posted on the BiblePlaces.com website. Our first photo comes from Volume 1: Galilee and the North, and is entitled “Mount Hermon and Caesarea Philippi aerial” (photo ID #: bb00140015). 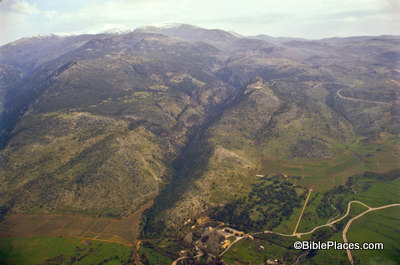 In this photo, the immense size of Mount Hermon can be clearly seen while it dwarfs the remains of the ancient city of Caesarea Philippi (located at the bottom center of the photo). The ruins of the Crusader period castle of Nimrud can also be seen sitting on the ridge above Caesarea Philippi in the upper right quadrant of the photo. This shot is helpful for a number of reasons. First, it gives the viewer an appreciation for the massive size of Mount Hermon. With its peak reaching an altitude of 9,230 feet (2,814 meters), it is almost three times the height of any other peak in the territory of ancient Israel. Secondly, it shows the geographical relation between the castle of Nimrud and Caesarea Philippi. Although I have visited both sites a number of times, the fact that they were both built on the same ridge escaped my notice until I saw this picture. However, those two reasons are not why I decided to feature this picture in today's post. The third and most valuable reason is that it can be used effectively as an illustration when teaching or preaching on the Transfiguration of Jesus. The Transfiguration occurs in Matthew 16:28-17:9, Mark 9:1-9, and Luke 9:27-36. In each of those books, the event is immediately preceded by the discussion that Jesus had with his disciples where Peter declared, “You are the Christ, the Son of the Living God.” Matthew and Mark tell us that this conversation occurred in the region (or district) of Caesarea Philippi (Matt. 16:13; Mark 8:27). A few days later, Jesus took Peter, James, and John up on a mountain where He was transformed in front of them. Matthew and Mark describe the location as “a high mountain” (Matt. 17:1; Mark 9:2), and Luke refers to it as “the mountain” with a definite article (Luke 9:28). Looking at this photograph it is not hard to see which mountain the gospel writers had in mind. If they were in the region of Caesarea Philippi and they went up a high mountain … indeed the most noteworthy mountain in the area … then it is not difficult to figure out which mountain was intended. 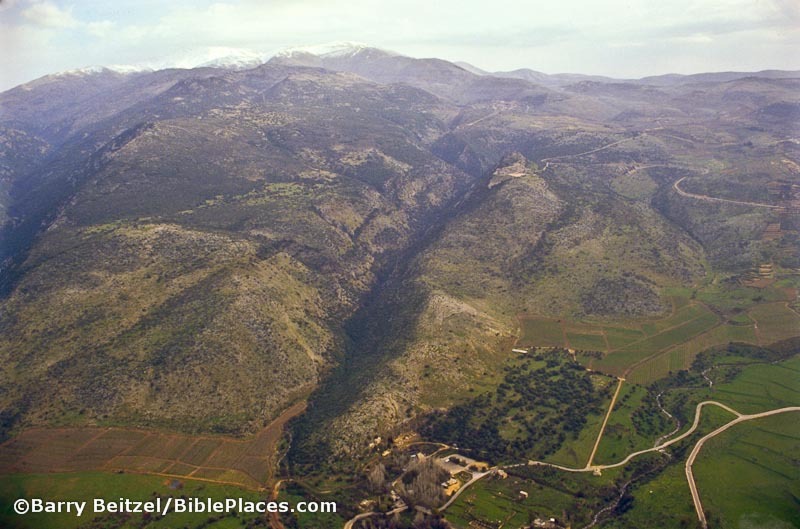 Over the years, some have interpreted the “mountain” in these passages as referring to Mount Tabor on the eastern edge of the Jezreel Valley, but given the geographical indicators provided in the text, Mount Hermon is a more likely candidate. For a teacher or preacher, a photo such as this could be used as a dramatic backdrop to a discussion of the pivotal conversation Jesus had with His disciples in this region and the Transfiguration on the mountain. By looking at this photo, the listener can easily picture the entire chain of events: the private conversation somewhere down in the valley, the physical exertion of Jesus and the chosen three as they climb the tall mountain, the glorious transformation of Jesus appearing as a bright spot somewhere on the mountain as His face and clothes shone brightly (Matt. 17:2), and finally the appearance of a shining cloud as God the Father spoke to the disciples (Matt. 17:5). The use of a photo such as this can draw students and congregations into the story and engage their minds in a way that cannot be done with words alone. The picture enhances the message. This photo is included in Volume 1 of the Pictorial Library of Bible Lands and can be purchased here. The scaffolding and construction material inside the Dome of the Rock have elicited an emergency petition by the Temple Mount Faithful to Israel’s Supreme Court. In The Washington Post, Hershel Shanks describes how the Biblical Archaeology Society became caught in a dispute between the two halves of Cyprus. Wikipedia wins: Photography is now allowed in the archaeology wing of the Israel Museum. The first summer survey at Abel Beth Maacah was a success. The finds keep popping out of the ground at the Philistine city of Gath. Aren Maeir is providing daily updates and photos. The plaster at Ramat Rahel is being studied for traces of pollen in order to understand the character of the ancient royal gardens at the site south of Jerusalem. “Scientists have used a new x-ray technique to produce spectacular 3D images of Roman coins that were corroded inside pots or blocks of soil.” The article includes a brief video. The Dead Sea Scrolls exhibit formerly at New York’s Discovery Times Square and currently at the Franklin Institute in Philadelphia is moving to the Cincinnati Museum Center in November. All of which has led [IAA archaeologist Amit] Reem and other modern scholars back to the same site that drew the interest of the French diggers all those years ago. Though Clermont-Ganneau conclusively established that the structure at Sheikh el-Gherbawy was Christian – the mosaic cross left no doubt about it – his finding might actually strengthen the possibility that the tombs are there, Reem said. Early Christians saw the Maccabees as martyrs and would certainly have venerated their graves, he believes: In this version, the structure could have been constructed atop the lost tombs to mark their place. In 2009, Reem made an effort to clean and investigate the site. Many of the remains the Frenchmen had seen all those years before had been long since looted, but the team used radar to peer under the ground and detected massive walls and subterranean chambers of considerable size. The site, he noted, has remains of monumental construction; proximity to al-Midiya, which has the best claim to be ancient Modi’in; and a clear sightline to the sea. In other words, it would seem to match the criteria from the ancient writings. Since then, Reem has been trying, without success, to drum up funding that would allow the site to be properly excavated for the first time. A gold cache, one of the largest ever found in Israel, was discovered last week in a dig in the Apollonia National Park, near Herzliya, heads of the archaeological project said. The 400-gram gold stash, unearthed by a joint Tel Aviv University and Nature and Parks Authority team, is currently valued at over $100,000. The excavation began three years ago as part of work to prevent the collapse of the cliff on which the Crusader fortress in the Apollonia park stands. Since then the diggers have discovered numerous findings shedding light on the Crusaders in general and on the last days of the 13th century fortress in particular. Findings include hundreds of arrow heads and catapult stones from the battle in which the Mamluks conquered the castle from the Crusaders. In a landfill dug at the site diggers found shards imported from Italy and rare glass utensils. The full story is here. The Hebrew edition includes three photos. The archaeological site on Mount Gerizim has re-opened, 12 years after political conditions hindered tourists from visiting the area. A new drainage system in Giza has some hydrologists concerned that the erosion of bedrock could cause the Sphinx to collapse. A complaint has been lodged with Israeli police over the building material and scaffolding placed on the “rock” of the Dome of the Rock. The Holyland Magazine, designed especially for North American evangelicals, is now online. Earlier editions are also available. In the 2000s, the term "hat tip" (often abbreviated to "HT" or "h/t") rose to prominence in the blogosphere to acknowledge someone who has made a significant contribution toward an effort, or someone who drew attention to something new or interesting. It is considered good netiquette when sharing a link or news item to give a hat tip to the person from whom you learned of the item. Congratulations to Coleman B. and Jimmy R., winners of The Holy Land Revealed, produced by The Great Courses. We plan to have giveaways of other resources in the weeks to come and you’re invited to enter those drawings. Thanks to all who entered. I see that The Holy Land Revealed is still available for 70% off at www.thegreatcourses.com, in both DVD and video download formats. The Daily Star (Lebanon) reports on the continued excavations in the port city of Sidon. Excavations led by a delegation from the British Museum at the Frères’ archaeological site in the old city of Sidon unearthed more important antiquities during their 14th year, it was revealed Tuesday. Preparations also got under way for the construction of a museum to display the findings at the site. The construction is due to begin in September. Discoveries at the site since excavations began in 1998 have revealed artifacts from the Early Bronze Age, which began around 3,000 B.C., through to the Iron Age, which covered around 1,200-539 B.C. Among the latest discoveries was a particular type of Phoenician architecture, which the archaeologists said was not commonly found in Lebanon, consisting of stones cut for the construction of walls or floors. Over 50 amphorae were also found, as well as a stunning Attic vase, depicting two riders going to war wearing white tunics and holding spears. More details of the discoveries are given in the full story. Sidon is mentioned many times in the Old and New Testaments. Some passages indicate that Sidon was intended to be the northern border of Israel (Gen 10:19; 49:13; Judg 1:31; 2 Sam 24:6), and in the days of Zerubbabel cedars were imported for the Second Temple (Ezra 3:7). Both Jesus and Paul visited the city or area of Sidon (Matt 15:21; Acts 27:3). Though prophets condemned the city (Isa 23:2-12; Jer 47:4; Ezek 28:21-22; Joel 3:4), Jesus declared that Sidon would fare better on the day of judgment than Chorazin and Bethsaida (Matt 11:21-22). The Tall el-Hammam Season Six (2011) Report is available online. Matthew Kalman’s article on Oded Golan after his acquittal is now available (and no longer behind the paywall). The Star-Telegram features a gallery of photos of the new Dead Sea Scrolls exhibit in Fort Worth. This looks like a nice tour of Turkey to sites that most first-time visitors don’t see, but you won’t believe the price. One man has made a model of the Roman Colosseum using 200,000 Legos. We gave The Holy Land Revealed away when it first was created more than a year ago and we would just echo some of our comments there. A quibble: the course is entitled “The Holy Land Revealed.” This is a potentially ambiguous title. I was expecting more of a geography-type course. But this is clearly focused on archaeological discoveries that illuminate the land’s history. Not only that, you should know that it is not evenly balanced across the periods. This is not surprising if you know Magness’ expertise. Naturally she is going to teach at greater length what she knows best. The Holy Land Revealed is not something produced or sold by BiblePlaces.com, but we believe that it is a useful resource that our readers would enjoy. The course does include dozens of photos licensed from our collection, but we receive no royalties from sales. We have two copies to give away. One will be given away to entrants who use the email form. The other will go to those who enter with PunchTab. You can enter either or both. If you cannot see the forms below, click here. The giveaway ends this Friday at noon Eastern Time. We have no idea how long the sale will last. A colorful mosaic depicting Samson and a pair of ignited fox tails has been discovered in the excavation of a Byzantine-era synagogue in Galilee. The depiction of Samson is accompanied by two female faces and a Hebrew inscription that speaks of rewards for those who do good. Huqoq is an ancient Jewish village located approximately two to three miles west of Capernaum and Migdal (Magdala). This second season of excavations has revealed portions of a stunning mosaic floor decorating the interior of the synagogue building. The mosaic, which is made of tiny colored stone cubes of the highest quality, includes a scene depicting Samson placing torches between the tails of foxes (as related in the book of Judges 15). In another part of the mosaic, two human (apparently female) faces flank a circular medallion with a Hebrew inscription that refers to rewards for those who perform good deeds. "This discovery is significant because only a small number of ancient (Late Roman) synagogue buildings are decorated with mosaics showing biblical scenes, and only two others have scenes with Samson (one is at another site just a couple of miles from Huqoq)," said Magness, the Kenan Distinguished Professor in the department of religious studies in [University of North Carolina at Chapel Hill] College of Arts and Sciences. "Our mosaics are also important because of their high artistic quality and the tiny size of the mosaic cubes. This, together with the monumental size of the stones used to construct the synagogue's walls, suggest a high level of prosperity in this village, as the building clearly was very costly." The site is being excavated by Magness along with David Amit and Shua Kisilevitz of the Israel Antiquities Authority. The IAA has released three photos (direct link) of the mosaic floor, but none of them show Samson or the fox tails. Amit describes the scene: the "mosaic contains a description of the biblical Samson and two pairs of foxes with a flaming torch connecting their tails." The story is recorded in Judges 15:3-5. Jodi Magness, David Amit, and Shua Kisilevitz, co-directors of the Huqoq Excavation, with the mosaic. Photo by Jim Haberman. Huqoq mosaic with female face and inscription. Photo by Jim Haberman. Female face in Huqoq mosaic. Photo by Jim Haberman. The story is reported by the Jerusalem Post, Arutz-7, and others. A volunteer working at the excavation this summer posted his experiences on a blog, but he does not mention the synagogue or Samson.